Discovered by John Herschel on September 8, 1829. NGC 147 was discovered by John Herschel in 1829; he numbered it h 29 in his catalog of 1833, and GC 72 in his General Catalogue of 1864. 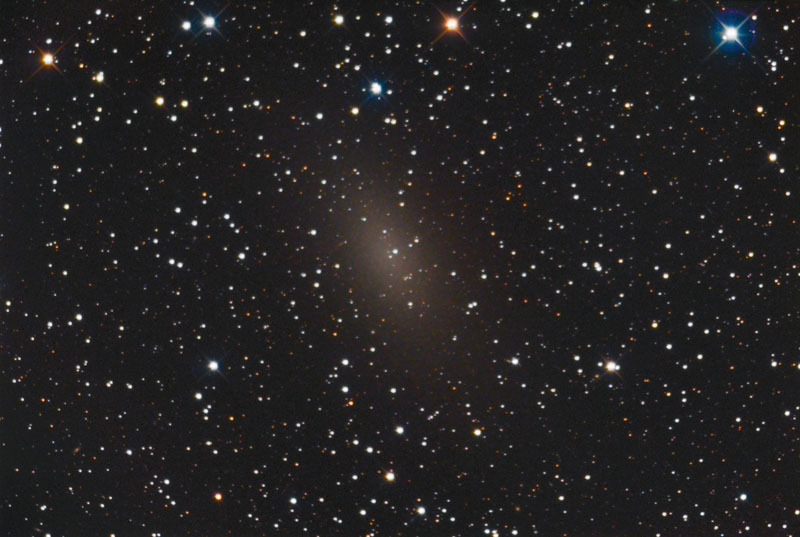 Dreyer, in his NGC, describes this object as very faint, very large, irregularly round, gradually suddenly much brighter middle, star of 11th mag nearby. NGC 147 was recognized as a Local Group member galaxy, together with its neighbor NGC 185, by Walter Baade (1944), when he resolved them into stars with the 100-inch reflector on Mt. Wilson. 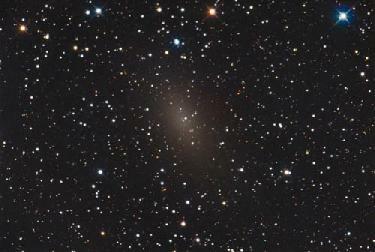 These two dwarf elliptical galaxies apparently form a physical pair, as they are only 58 arc minutes separated. Both are more remote satellite galaxies of the Andromeda Galaxy M31, and currently somewhat closer to us than this galaxy. The distance of NGC 147 is given at values which adjusted for our scale, correspond to about 2.4 million light-years (van den Bergh); Mike Irwin's value corresponds to 2.2, Mateo's to almost 2.8 million light-years. The image on the right was obtained by Chris and Dawn Schur from Payson, Arizona with their 12.5" f/5 Home made Newtonian and SBIG 10XME NAGB CCD camera with enhanced cooling. This is an LRGB composite image, exposed LRGB = 120:20:20:20. Sidney van den Bergh. The Binary Galaxies NGC 147 and NGC 185.